Billy Martin - 1 year - .260 avg, but I discovered a little gem from Indians.com about Martin: "Billy Martin was a beautiful man," Corrado says. "He was in-between jobs one time, and he came in with the Yankees. Two little kids came by, they were about 12-years-old. And they say, 'Hey usher, we want to talk to Billy Martin.' "I went up and got Billy Martin, told him, 'Two little kids want to talk to you.'" Martin came right down to talk to the kids. "He came down, talked to those two little kids, put his arms around them, made them feel like a million dollars," Corrado says. "I walked up the ramp with him, and I said, 'Billy, that was great of you to talk to those kids.' "He says, 'Remember this: These are our future fans.'" Even so, his picture here suggests, "You have no idea just how much dirt I am going to kick up in my lifetime..."
Bobby Avila - 10 years - 1951 .304/.374/.410, 1954 - .341/.402/.477 He was an AL All-Star in '52, '54, and '55. In the '52 All-Star Game, he batted 1 for 2 and then in '54, his return visit netted him 3 for 3. He also took part in the '54 Indians World Series win, though he only batted a pitiful .133 - ouch. Still, the fact that he has incredible longevity, made multiple all-star appearances, and a World Series win under his belt, Avila gets the honor of being chosen as the best #1 in Tribe history! Casey Blake - 5 years so far - Better than .250 avg four of those years, pulling near (or more than) 20 HRs each season while playing in several positions. He has the potential to be a great Triber, if they keep him around long enough. Del Unser - 1 year (1972) - .238 avg with 1 homer. As far as the Tribe goes, I found very little about him. Overall, his brief appearance in an Indians uniform was about average for his career - he had some better years, and some worse years. But, whose idea was it to take a picture up the guy's nose? 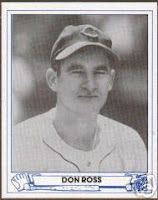 Don Ross - 2 years (1945-46) - He was traded for fellow #1-wearer Roy Cullenbine in 1946. At least his average was more than .260 during his trip through the clubhouse, which thus far seems to be rare for the guys wearing #1... His card shown here is a Play Ball reprint. Glenallen Hill - almost 2 seasons (1992 and part 1993) - He has the dubious of honor of recently being named in the illicit steroid debacle. That, however, is not what keeps him from being named the best #1. Rather, like many of the folks on this list, he just wasn't all that good while with the Tribe. I find it interesting that in 1993, he hit 18 homers, yet only showed a .224 average. 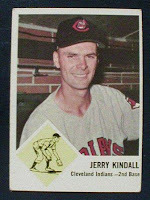 Jerry Kindall - 2 years (1963-64) - Kindall played 2B and SS during his stint in Cleveland. In '62, played in 154 games and had 123 hits. Nothing earth-shattering, but at least that's almost a hit per game. According to Wikipedia, "No one since 1920 with at least 2000 at-bats has a lower career batting average than Kindall's .213, but he did have above average power for a second baseman." Jimmy Wasdell - almost 2 years (1946-47) - His first season as an Indian, Wasdell batted only 41 times (he was picked up from the Phillies, where he had played 51 games) and pulled his career average (or close enough) 268. In '47, however, he only had one at-bat and go nowhere fast, resulting in a 000 average. Makes you wish you just hadn't even bothered to show up. 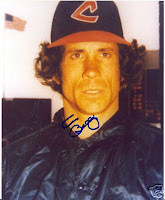 In fact, this auto'd picture (I could not find him in a Tribe uni) for sale online seems to suggest that very thought. Johnny Grubb - 2 seasons (1977-1978) - Posting some of the better averages for this group, Grubb batted for .301 avg his first year and .265 avg his second with the Tribe. What I found to be eye-popping for a player wearing #1 was his .425 on-base percentage in '77. Before coming to the Tribe, he was an All-star outfielder. Jose Cardenal - 2 seasons (1968-69) - Cardenal had 40 stolen bases in '68 and 36 in '69. He also made two unassisted double plays in 1968. He batted .257 in both seasons, a feat not easily duplicated, I would think. An interesting tidbit I discovered about Cardenal: he developed the cup-shape design for the end of the bats. How about that? Top that off with a pose that says, "I will kill you with this bat if I have to." 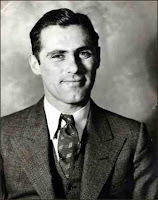 Lyn Lary - 2.5 seasons (1937-part of 1939) - While with the Indians, he set his career high hits and doubles. Also in '37-'38, he had the same number of BBs (88) each year. In 1939, he was traded three times, and retired in 1940. Mike de la Hoz - 4 seasons (1960-1963) - de la Hoz posted near or above .260 average for each year with the Tribe, except for 1962. In 1962, he only had 12 at-bats and had one hit. Heavens, he posted a .083 average. Now, on a positive note, he started in more than 80 games his rookie year. In this card, he looks like he had just come off the bus after a long trip and told to smile for the camera. Milt Galatzer - 4 seasons (1933-1936) - I could not find much information about Galatzer. He had an avg on par with many of the #1's in this list, though he batted for .301 in 1935. He played outfield and 1st base for most of his career, except for part of 1936. For whatever reason, he was move to Pitcher for part of that year. He pitched in one game for six innings, and managed to pull a 4.50 ERA. He was traded to the Reds, who promptly put him back at 1st base. The image here is the only I could find of him. 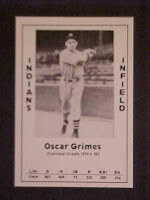 Oscar Grimes - 5 seasons (1938-42) - Grimes played all over the infield throughout his career. His average never rose above .269 with the Tribe (or above .280 throughout his career). In 1940, he only had 13 at-bats, not getting on base at all. 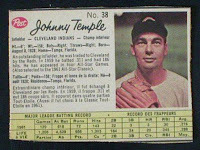 His best Tribe-based season came in 1939 when he posted his .269 avg and .368 OBP. 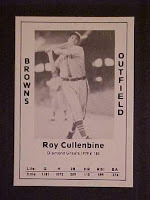 Roy Cullenbine - 2.5 seasons (1943-45) - In 43 and 44, he batted for .289 and .284, respectively. This was solid enough to earn him a spot on the 1944 All-Star team. He only played in 8 games for the Tribe in 45 before being traded to the Tigers (who went on to win the series in 45, thank you). Tommy Hinzo - nearly 2 seasons (1987, 1989) - Hinzo only played in 85 games during his two-year career, ending with a career-total .248 average. Unfortunately, that is about all I can find on Hinzo. Well, other than his last name used to Lee. Tony Fernandez - One season (1997) - He was signed in 96 after a broken elbow got him booted off the Yankees. At the time of his signing, he held the major league record for career fielding percentage by a shortstop at .980. During his time as a Triber, he a batted .286 avg with 11 homers and 44 RBIs. Too bad the Tribe lost the World Series that year. 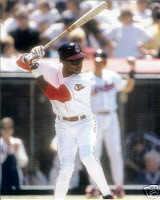 Wil Cordero - 4 seasons sorta (1999, 2000-2002) - In 1999, Cordera joined the Indians as a left fielder. In 2000, he was traded to the Pirates who sent him back. He was a young kid when he broke into the majors (like 16-17 years old) and seemed to have trouble follow him both on and off the field (1997 domestic abuse arrest). The sad thing is that even with all his physical and personal issues, he still falls within the average range for Tribers wearing jersey #1 - He batted around .250 or so each year, though his first with the Tribe was .299, better than many on the list. Great job! You really did your homework with this post. I counted four ex-Orioles on this list (Avila, Blake, Temple, Lewis, and Horn). To my knowledge, none wore #1 with the O's (Casey Blake wore #61 as a Sept. callup!). 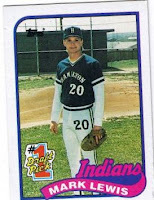 I actually have a Sam Horn Indians card, a 1994 Score. I'll send you a scan when I get a chance. Thanks! It was a lot more work that I thought, and there even MORE folks that wore good ol' number 2, so stay tuned! This has been a wonderful education into the player histories!